Just like WordPress, blogging is constantly evolving, too. By choosing between any of the premium WP blog themes, you get a chance to customize your website to your likings. It normally takes just a few clicks (sometimes only one) and your new website is of completely different look. Have fun with it and modify the elements to your personal needs. 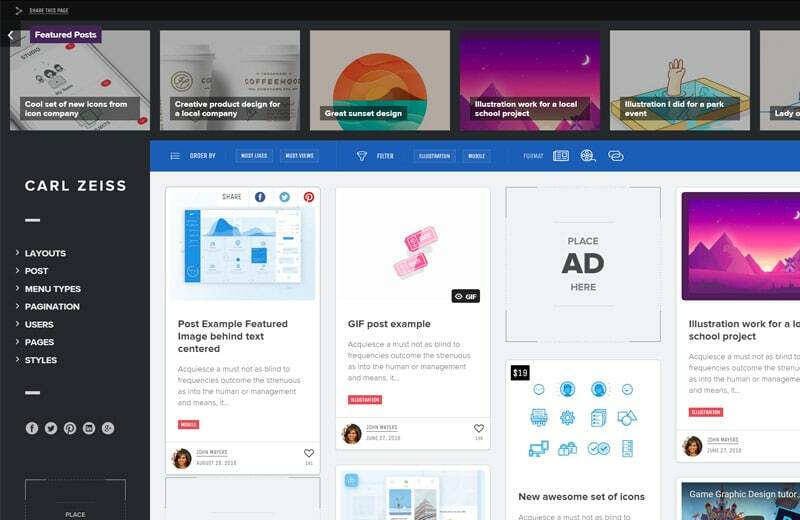 Bring your project in front of your targeted audience in the most unique way possible. Not only will your new website look jaw-dropping and very appealing to your new and current visitors’ eyes, if structured well, all the major search engines will rank it towards the top, as well. 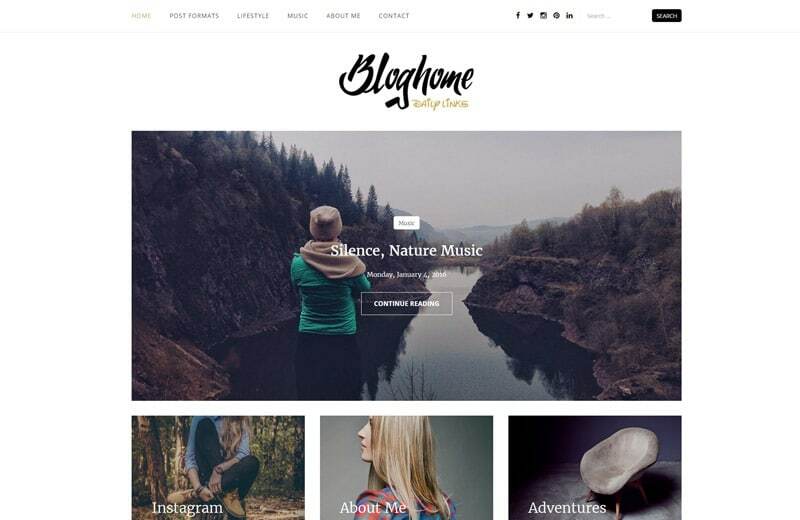 Our collection of the hottest WordPress blog themes covers themes perfect pretty much for any kind of blog you fancy. Personal, travel, food, corporate, sport, you name it. Go ahead, take a peek at them and pick your preferred one. 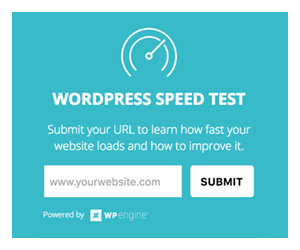 If you are completely new to WordPress and blogging, we recommend a great and very thorough guide to creating a WordPress Blog that goes into all the details needed to publish your first post on your great new Blog. If you are ready to get all your secret desires sorted when it comes to creating that perfect website, Soledad has you covered. With more than 900 demos (yes, that is not a typo, 900+!) and hundreds of blog and slider combinations, you barely need to do any work at all. Find your preferred combination, add your personal touch to it and you are pretty much done. The only thing that will eat your time is the process of going through all those demos and layout combination. Hint: Don’t be too picky. Other than that, you can get your idea or project online in mere of minutes. Or you just want to update your existing website and make it fresh for your loyal visitors. 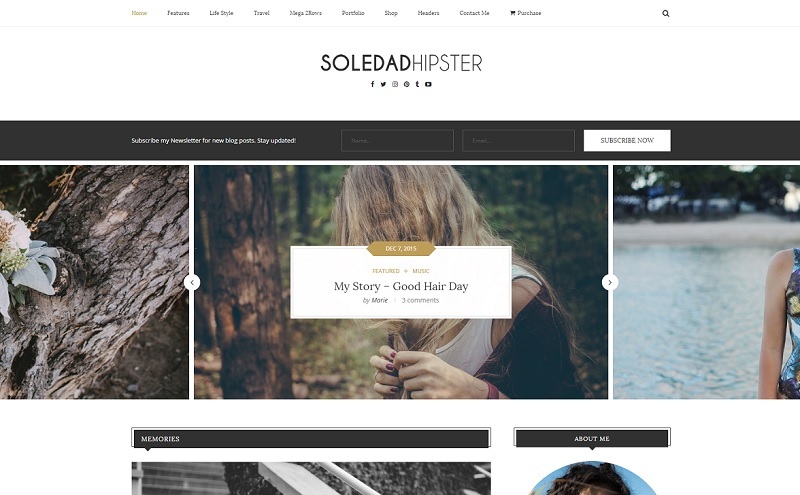 Whatever there is you need, this top selling WordPress blog theme will definitely do the job for you. 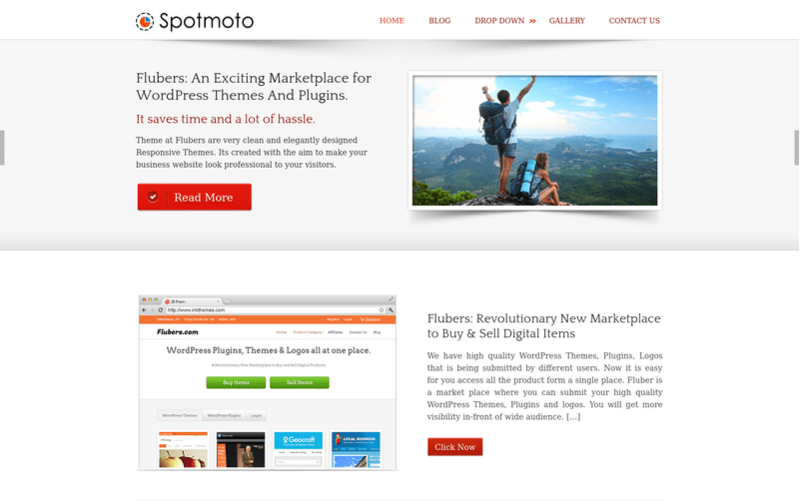 SpotMoto WordPress theme is suitable for the pro-bloggers who writes and posts regularly. The theme allows customization of the blogs as per the requirement of the user. You can easily add video and gallery images so that your page looks more effective and efficient for imparting any information to the visitors to your site. Map integration – the theme allows the integration of the map in the homepage as well as in different posts. 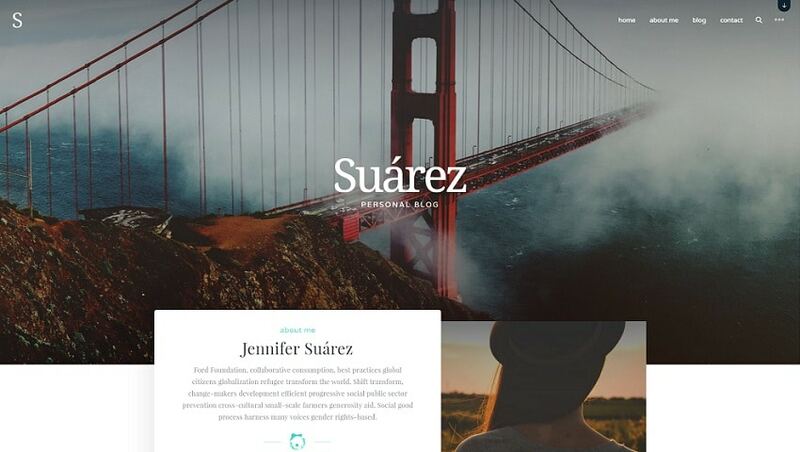 Coder or not a coder, especially for the latter, Suarez is a theme that will help you build an amazing blog without dealing with a single line of code. Visual Composer page builder allows you to structure the website exactly how you like and put your personal touch to it. All this will help you attract your readers and have them hooked with the amazing content featured on your blog. Suarez is a theme with super clean posts what will attract the users and make them craving for more. Both your visitors and search engines will love your blog what calls for more traffic and more loyal readers. 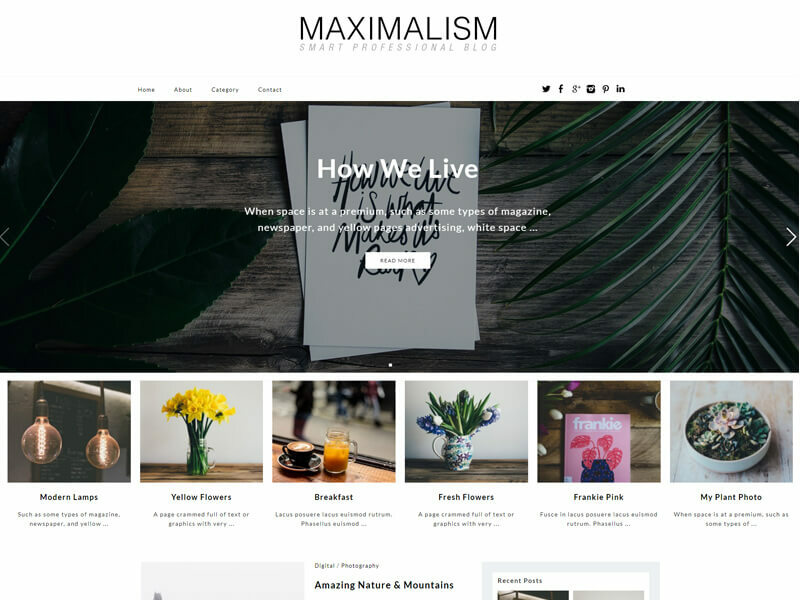 Maximalism Blog is a contemporary and elegant theme designed specifically with bloggers and journalists in mind. The customizer options make it easy to add your social media links, upload your own logo, select theme colors and much more. It also offers nice styles for native image galleries and supports the Instagram Feed plugin so you can cross promote your Insta feed on your site as well. Maximalism theme has a build in fully responsive slider and right side widgets. Interested in standing out from the crowd and be as unique as possible? 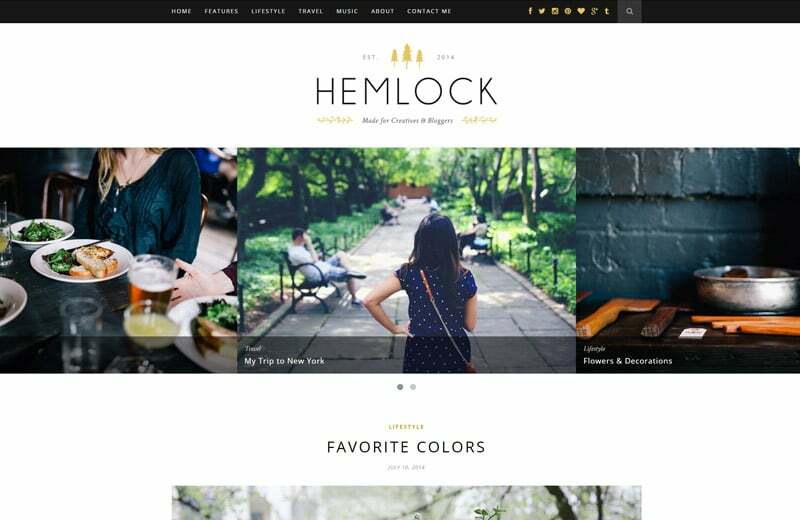 Clean aesthetic and straightforward functionality of Hemlock blog by Solo Pine allows you to be just that. No matter in what niche you are, this theme is perfect for every creative blogger. Its minimalistic, distraction-free, one-column layout will give your creativity a special touch. Due to being able to create a stunning blog, your visitors will eagerly browse throughout your website, reading pieces of your quality content. To get the most out of Hemlock, Solo Pine team offers you total customer support. Knock your readers’ socks off with Redwood’s clean and classic design that was created with bloggers in mind. 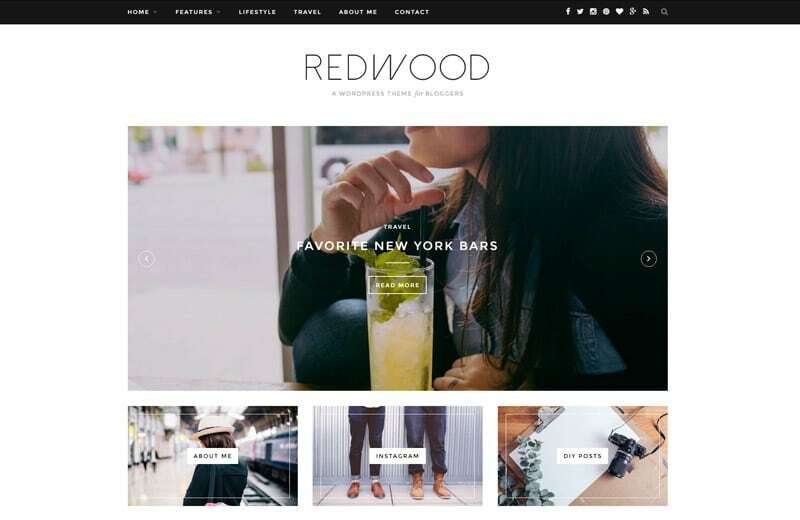 If you are after simple WordPress blog themes, it might happen that Redwood is the one for you. Not only is the overall look super minimalistic and uncomplicated, you can customize your blog with just a click away. Choosing between a wide variety of color options, beautiful full-width slider, promo boxes and a lot more, you can fully personalize and craft your blog the way you fancy. In case you are in need of any help, lovely team over at Solo Pine offers you full customer support. To spread your stories in a clean, modern, personal, simple, yet professional, way, BuzzBlog theme can be considered your go to theme. Not only is this blog theme fully responsive, viewable on all the devices you and your visitors are using, desktop, tablet or mobile, it is loaded with a ton of solid features. 11 different CSS styles (or build your own one), 15 custom page templates, more than 60 shortcodes, 7 blog layouts, 8 custom widgets and more. The admin panel delivers a clear and very easy to use tabs layout. Meaning, finding yourself the right settings has never been easier. 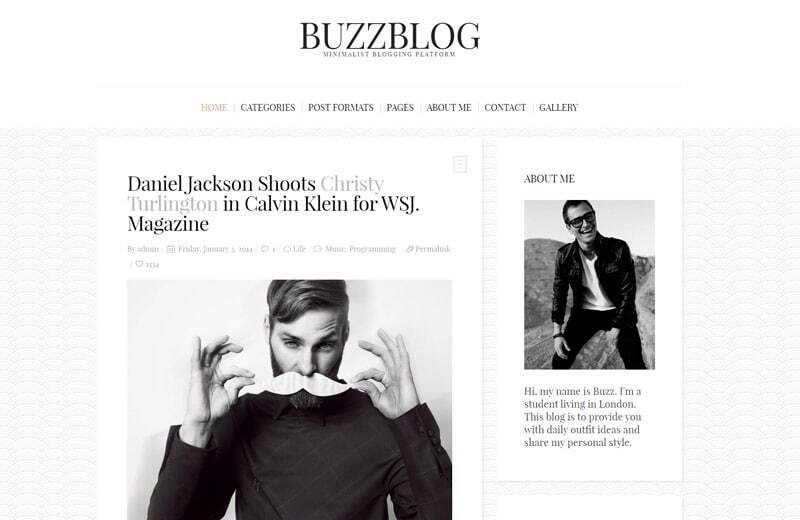 To grab you visitors’ immediate attention, every single element of BuzzBlog’s header can be changed and customized to your likings. Not to mention, the double-B theme allows you to create a multilingual website. 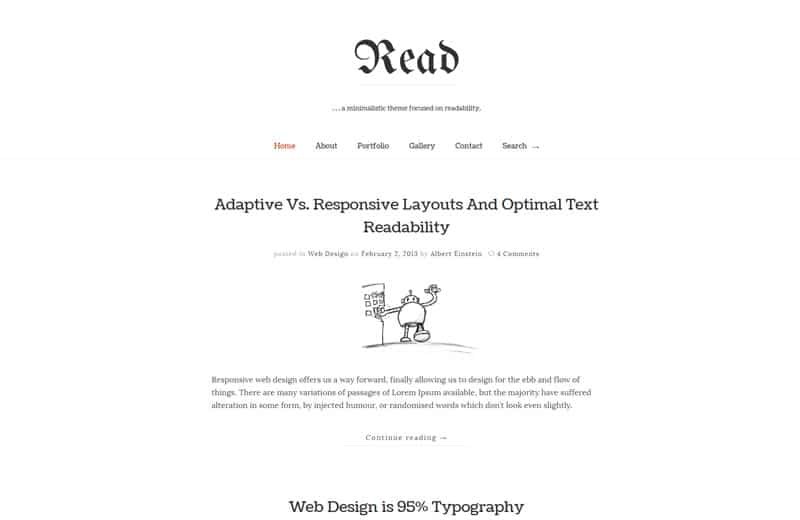 In case you plan to create a website, focused mainly on readability, Read WP minimalist blog theme is the one for you. Mobile optimized, your visitors will be able to enjoy reading your content from just about any device they own. With SEO and translation in mind, you can easily localize your website, as well as get ranked higher in search engines for targeted niche keywords. Bring your blogging plans to life with Read WP and allow your trustworthy followers the best online experience ever. When you plan to start a blog, it all begins with storytelling. 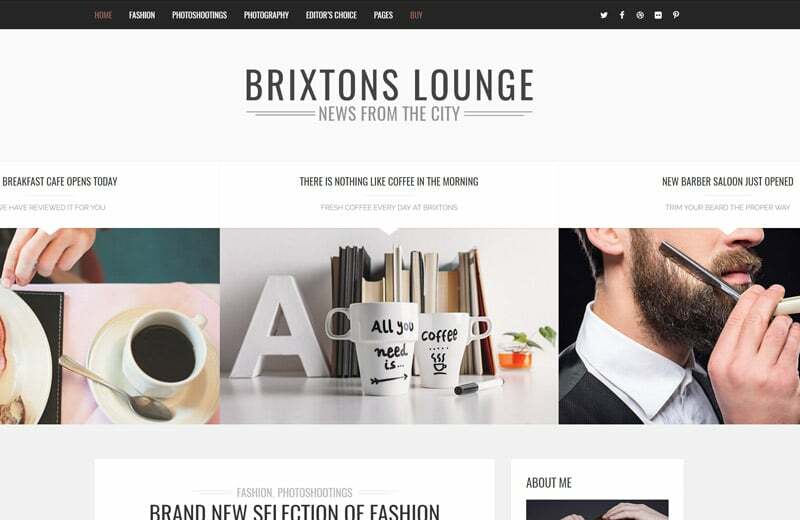 With its elegant, clean and minimal design, Brixton theme is a perfect choice for just about any personal blog. 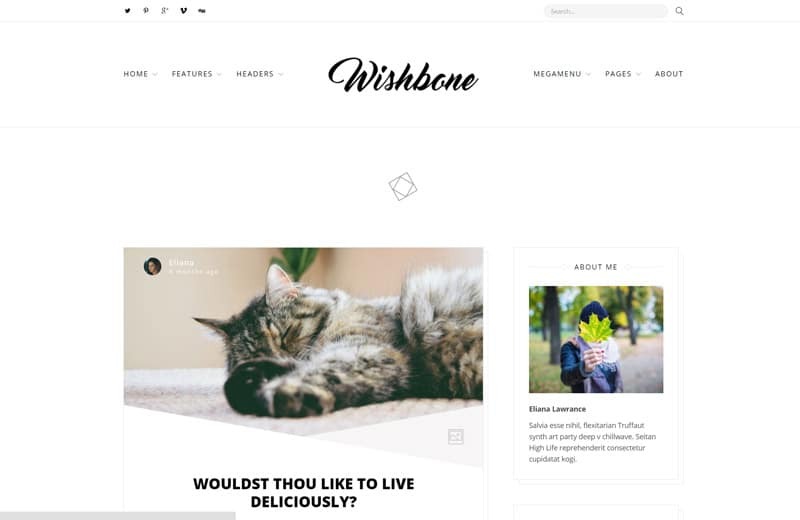 To get to the bare minimum and straight to the point, offering your visitors a distraction-free experience, this theme eliminates all the nonessential animations and slideshows. Hit your readers with your quality content and quality content only. With integrated widgets, your main social media accounts, Facebook, Instagram and Twitter, will decorate your sites and help spread the word of your new awesome blog. 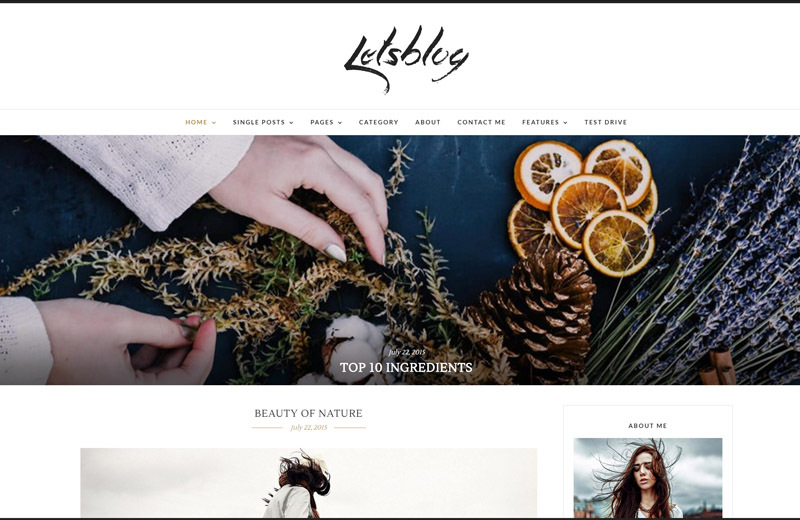 Aside from being a blog theme, with Lets Blog, you can also create a beautiful, magazine-styled website. With its full responsiveness and retina ready design, your happy readers can browse and read your content from any device, desktop, mobile or tablet. To make changes, you can check instant preview via Live Customizer and make immediate corrections without the extra hustle. Import predefined blog posts styles with just one click and benefit from multiple gallery template layouts for all occasions. 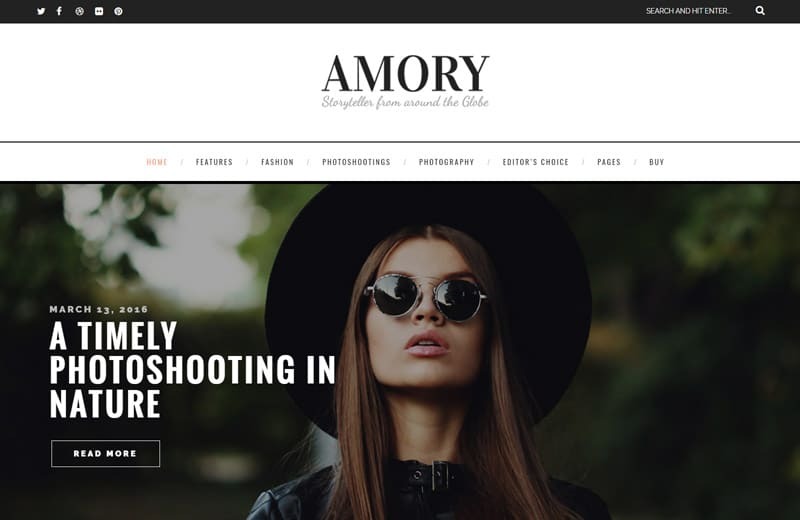 Highlight your content with Amory theme, perfect for creative, fashion and photography websites. High on the list of fashion blog themes, you can also turn Amory into a more dark and manly design. Hipster look not excluded. To really amaze your readers, integrated Revolution Slider helps you take everyone’s breath away. Only sky is the limit when customizing your Slider, using Revolution Slider. Since content focused websites are kept alive mainly through advertising in this day and age, Amory has you covered with ad blocks, as well. It comes with a pack of widgets that were created specifically to support Google advertising. With so many options to choose from, Amory theme has you covered with a lot more than you think. When you need something extra, like an online store or whatever, Oleander theme gets you covered with just that. 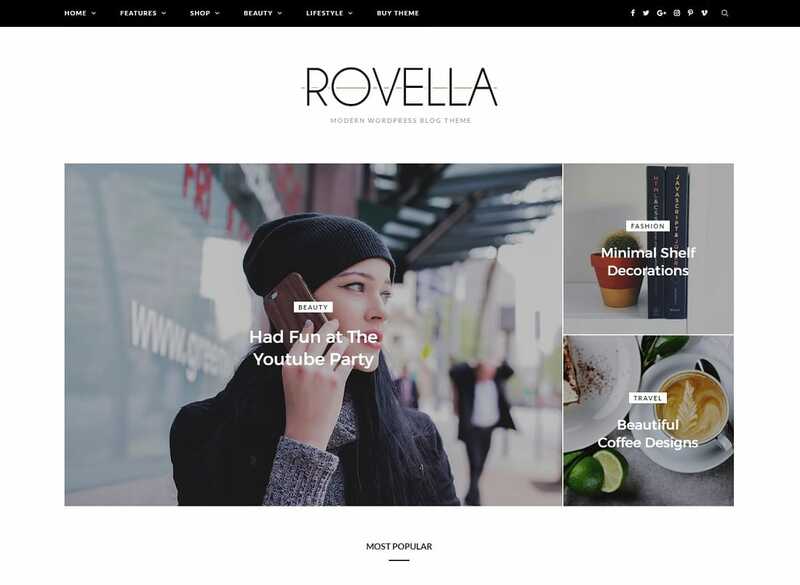 It’s fully compatible with WooCommerce so you can create both a blog with tons of compelling content, as well as a lovely shop full of awesome products. 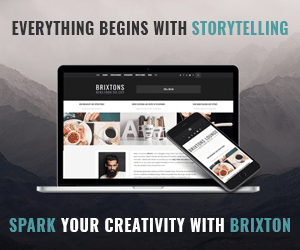 All your visitors will immediately get hooked by an incredible full-width slider and promo boxes below the slider, showcasing your favorite or most read content. Not only that, you can create a jaw-dropping website using various blog layouts, that support 4 main blog formats. 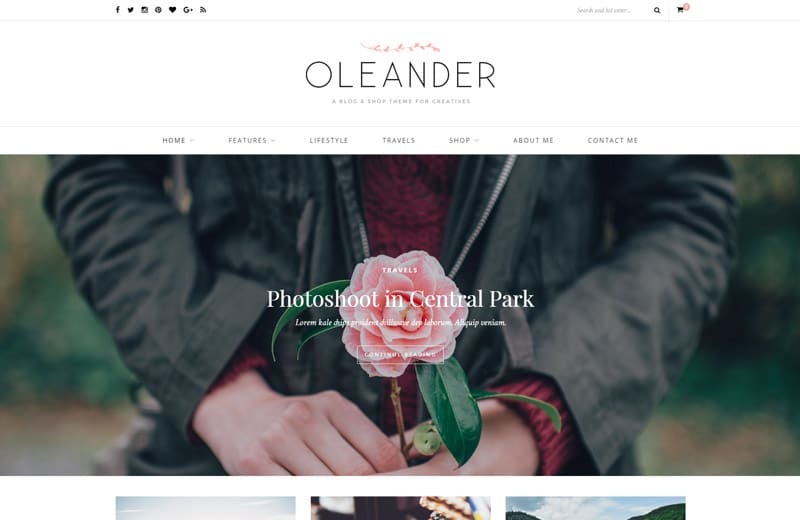 When buying Oleander theme, you have the doors open to expand your blog in the future by creating a shiny web store, selling goodies to your readers. Compatibility with WooCommerce – create your very own shop! Whoever is after something more classy with a touch of vintage, Wristy theme is the one you might consider getting yourself. Follow latest trends and build a website that is suitable for a big specter of niches – personal blog, photography, fashion, adventure and others. 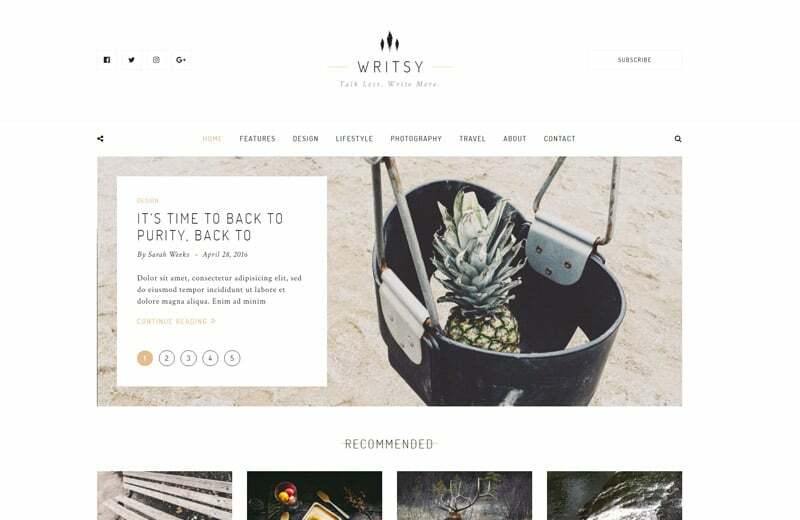 With Wristy theme, you will get your readers to enjoy your content from any device. Its full responsiveness, clean and minimal design beat many blog themes on the market, making your website shine and one-of-a-kind. 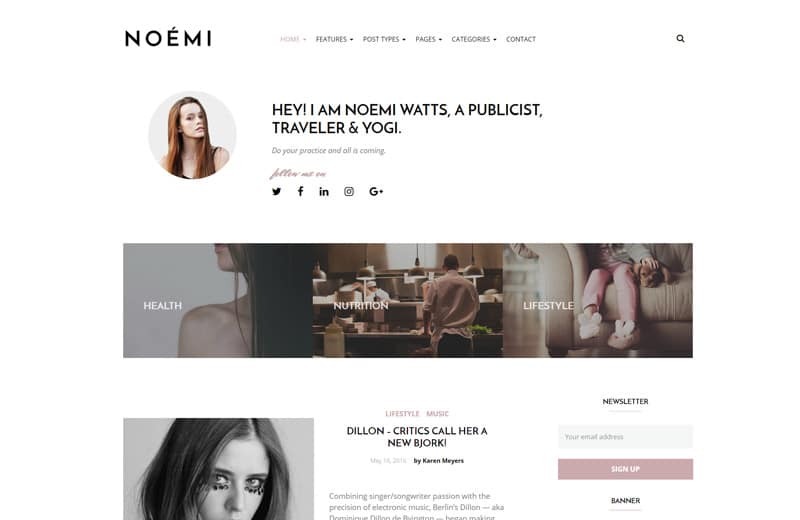 For everyone who is after a beautifully designed and simple WordPress blog theme, Noemi could be your theme of choice. It was created to focus on independence and creativity of bloggers and to emphasize individuality. You can benefit from a fully responsive and retina ready design that works on all devices. Choose your post format, blog layout and customize your website with preferred font and custom color and bring to your readers something remarkable. To save you plenty of your precious time, you install it with just one click, pick one of the 10 predefined schemes and you are good to go. It actually is that simple. Furthermore, you can customize the font to your taste, use custom widgets and create background the way you like it. 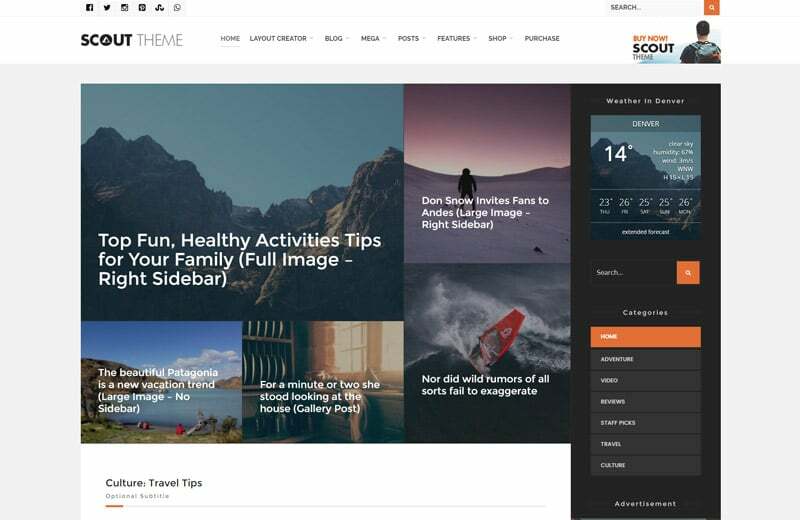 For personal blog needs, suitable for food, travel, adventure, sports and other entertaining topics, you should take Scout theme in consideration. With its classic, modern and elegant look, fully responsive and easy to use layout, your website will deliver fresh content in a beautiful way. Benefit from such features like custom widgets, one-of-a-kind “mosaic” section, unlimited color options and a ton of other very useful whatnots. Hence the name, all the adventurous one out there, you and Scout might become the best travel buddies through your epic journey of blogging. Attention creative bloggers! Themecomics present you Blog Home WordPress theme that is built with focus on classically modern design. Impress your readers with a fully responsive design, and search engines with SEO friendliness. With its one click import process, you can quickly update your website with fresh content and visuals. In case of worry, don’t bother, Blog Home’s staff is at your service to help you create the best website your mind can think of. Various widgets for social media, about us, recent posts, etc. 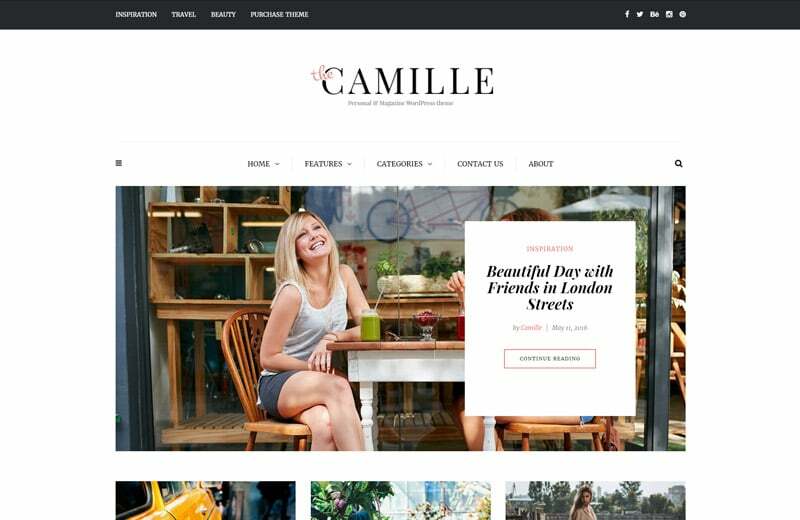 To follow the stylish and elegant hype, multipurpose WordPress blog theme, Camille, is perfect for just about any kind of a personal blog you plan to build. With its unique design and plenty of customization options, your website can easily stand out from the crowd. Unlimited homepage variations, simple one click install, 7 blog layouts and a ton more features to choose from that will save you on time spent figuring out how things work. 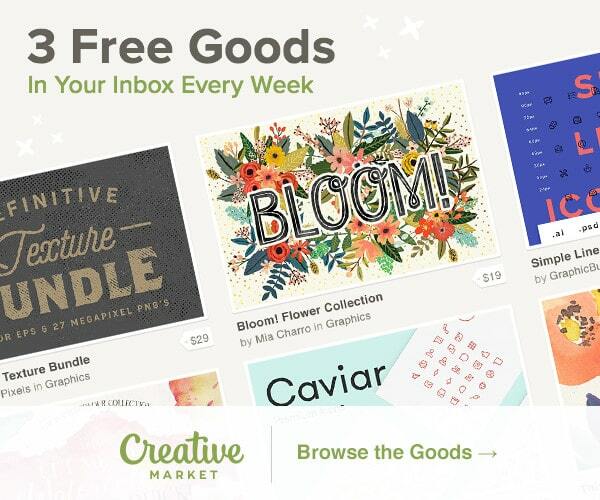 With WooCommerce integration, you can also grow your blog into a shop and sell amazing work. 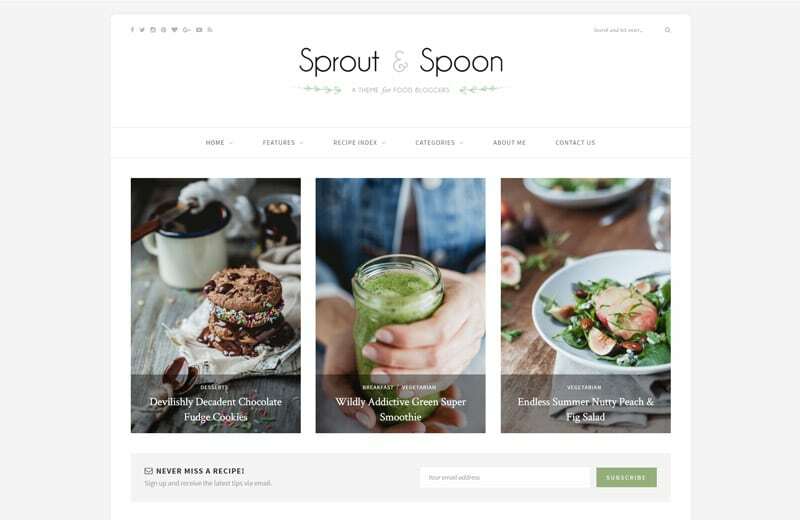 If food is your true passion, Sprout & Spoon food blog theme is the theme of choice for you. Display your delicious and beautiful creations with the world and share your recipes through Solo Pine’s Recipe Plugin. All your readers’ mouth will water when browsing your eye-catching featured area full of incredible content. Bring your culinary masterpieces in front of hungry people and fulfill their food cravings. However, in case you aren’t really into food and stuff, Sprout & Spoon theme will serve craft and DIY bloggers just as well. Some folks already know what they are after. Meaning, if masonry grid style blogs are your thing, go ahead, give Sun theme a peek. Offering a ton of features and pre-crafted styles, you can bring your idea in front of the world wide web audience in no time. To offer your readers something more, create forums and start interesting discussions. Furthermore, create a community of trustworthy users and enable them to submit their content, as well. Not to mention, integrate an online store to your blog with WooCommerce plugin and start selling products your followers will go mad for. However, it’s not only via shop how you can earn yourself money. Sun theme has ad spots ready across the theme for you to place Google and other custom made ads. 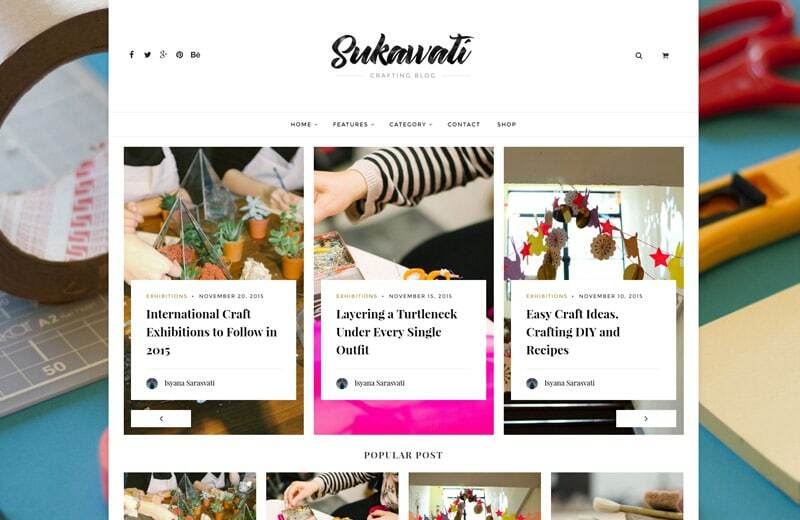 A clean and stylish blog theme, Sukawati is ready to serve a wide variety of bloggers: food, fashion, lifestyle, adventure, travel, sports, etc. Or maybe you just enjoy writing about different topics, your personal experiences and other whatnots, bring it all online with Sukawati theme. With the one click install feature, you can bring your idea to life in the most simplest way. Moreover, all the extra features will allow you to customize your website without much effort. Built with readability in mind, the theme was created to give visitors the most fluent experience when reading your fascinating articles. 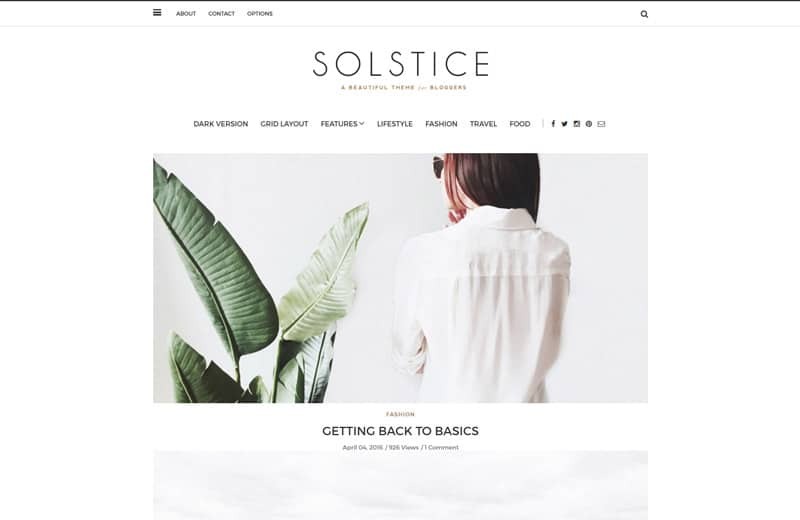 If you go for Solstice theme, you get treated with a multipurpose WordPress blog theme that is suitable for any kind of a personal blog. To be more specific, if you plan to launch a travel, fashion, food, lifestyle, photography or any other blog, this is the theme you should examine in great detail. To customize your site the way you fancy, with Solstice, you will be a step ahead of the competition. The process is super easy and gives your end product an incredible look, making your visitors thrilled to come back on a regular. With countless possibilities, you get a chance to present your blog in the most original and personalized way. 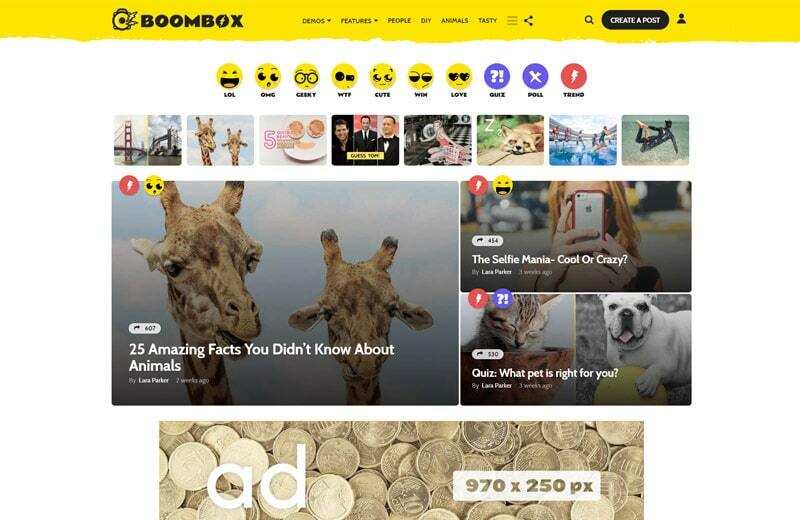 To increase the hype, buzz and virality, BoomBox theme’s flexibility will allow you just that. Packed with plugins and fully customizable, this theme will increase the popularity of your content with its sweet features. With BoomBox you can have your very own rating and voting system, as well as create polls and quizzes to keep your visitors active. Though a new one, it’s fun vibes and creativity made it a must on our best blog themes collection. Responsive and retina ready design are beneficial for user experience and all the fun features you will add to your site for your readers to play with. Whether you are after something more luxurious or simply an elegant blog website with max flexibility, CheerUp blog theme by ThemeSphere is the one for you. Offering more than 100 layout combinations, you can create a website that perfectly represents you and your business. Put up your logo, pick your favorite colors and fonts and you have a website that perfectly matches your personality. By CheerUp’s fully responsive, translation ready and SEO optimized design, you can bring your content in front of your existing and new audience in the most original way. 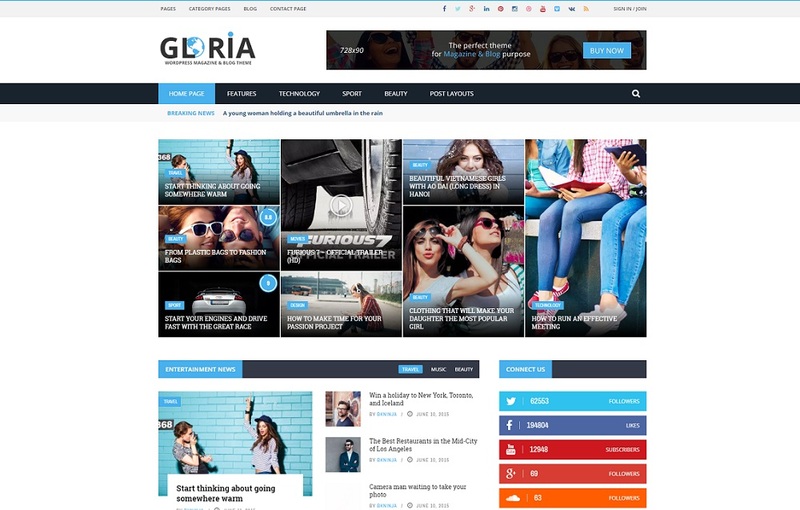 With a modern approach to blogging and a very easy to use admin panel, Gloria will ensure you to start blogging immediately, without the extra hassle. It works with pretty much any kind of news oriented websites. Let it be magazine, newspaper, lifestyle, review or just about any kind of other text based website, She is the one you cannot go wrong with. For the techies, it was built with SEO in mind so your page will rank well in all the search engines and drive organic traffic to your page. 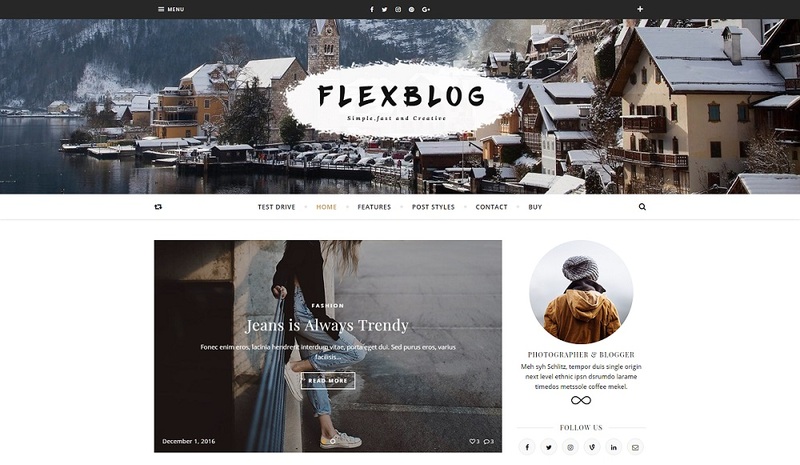 Needless to say, Flexblog is one of the most flexible WordPress blog themes out there. It has a very minimalistic and clean look and is super easy to use, perfectly suitable for all the beginners out there. However, even if you know the gist of it already and consider yourself advance, this can also be the theme perfect for you. Its flexibility fits every need. Fully optimized, responsive and retina ready design works perfectly with any device you use to browse the website. With this comprehensive list of top WordPress blog themes, you are one step closer to launching your new online project. Or it might be that you already run one (or a few) and need to update your website’s theme. Keep it fresh and updated and your readers will be happy to return, craving your new content.